Between the hours of noon and 3:00 p.m. on any given day, there is a small 798-square-foot cafe in lower Manhattan that is jam-packed with eager, hungry patrons. They are there to sample the latest and greatest culinary creations to hit the streets of SoHo. But this hot lunch spot doesn’t just serve traditional favorites, like soup, salad or sandwiches. Rather, it’s a one-of-a-kind Mediterranean yogurt cafe, where guests experience a variety of unexpected, delicious flavors and textures. The cafe, called Chobani SoHo, is the brainchild of Chobani Founder Hamdi Ulukaya, a Turkish immigrant/entrepreneur who rose to fame for introducing mainstream America to Greek yogurt in 2007. With this unique storefront, Chobani is engaging consumers like no other Greek yogurt brand on the market. By pairing Plain Chobani with hand-selected, artisanal ingredients, like pistachio and dark chocolate and cucumber and olive oil, it is single-handedly turning America’s most beloved breakfast food into America’s favorite lunch or afternoon snack. Chobani’s yogurt cafe is just one of many ways in which the company is effectively promoting Greek yogurt category growth in the United States, a country whose Greek Yogurt consumption pales in comparison to Europe. As the No. 1 selling brand of Greek yogurt in a $3.7 billion category, the company has come a long way from its humble beginnings in just under a decade. (The overall yogurt category topped $7.7 billion in 2015.) When Ulukaya bought a 100-year-old, shuttered manufacturing plant in central New York State in 2005, he had modest aspirations. First, he wanted to paint the walls. Then, he and five ex-Kraft employees embarked on a mission to provide Americans with the delicious, nutritious, natural and affordable cup of yogurt that he so enjoyed growing up in Turkey. It took more than 18 months to perfect the recipe for Chobani, and in October 2007, the first cups hit high-end specialty store shelves. Two years later, Chobani went mainstream when Stop & Shop, New England’s largest retailer, signed on. Other major retailers quickly took notice, as did other major food manufacturers, who followed suit with their own Greek yogurt varieties. After years of triple-digit growth, the eight-year-young Greek yogurt category has grown uber-competitive. As the category became more saturated, Greek yogurt sales inevitably slowed — from 150 percent in 2010 to just 5.5 percent in 2015, according to Nielsen. Chobani, however, is confident that the category will return to its former glory, driven by innovations that push the category beyond the breakfast table. “We think the market can double in the next in five years, but to do that we have to inspire, innovate, educate and push boundaries,” says McGuinness. As the current category frontrunner, Chobani is committed to providing a healthy mix of incremental and breakthrough innovation to consumers. On the incremental side, Chobani is laser-focused on innovating, renovating and curating its three base platforms — Core, Flip and Simply 100 — which represent 90 percent of its business. Those innovations are delivered in various forms, from industrial or graphic design of packaging to line extensions, like Simply 100 Crunch, and limited batch offerings, like Peppermint Perfection Flip. “We spend a lot of time keeping that base very fresh and vibrant because frankly you can’t innovate your way out of a core decline. Those three platforms are in their infancy, so we have a lot of runway with them,” says McGuinness. Meanwhile, Chobani is capitalizing on the opportunity to stretch its brand with savory and indulgent creations that validate Greek yogurt’s day-part expansion beyond breakfast, when 75 percent of the product is currently consumed according to Nielsen. New product lines launched in early 2015 such as Chobani Mighty Oats and Ancient Grains and Chobani Indulgent, fall into this category, while lunchtime creations passed out at Chobani SoHo confirm the consumer’s appetite for using Greek yogurt as a culinary canvas or a smart swap for sour cream, oil, butter, mayonnaise and more. The company also launched a platform designed specifically for kids and tots, Chobani Kids and Chobani Tots Greek Yogurt Pouches, which explore new flavor profiles, like Mango + Spinach and Banana + Pumpkin. With only 40 percent market saturation, Chobani has an opportunity to win over the other 60 percent of American consumers. But getting people to try something new can be tricky. When it comes to marketing Chobani’s new products and recipe creations, McGuinness asserts, “seeing is believing.” That’s why marketing focuses especially on driving trial and raising awareness, through national campaigns, event marketing and sampling programs that introduce even more people to the products and the category. 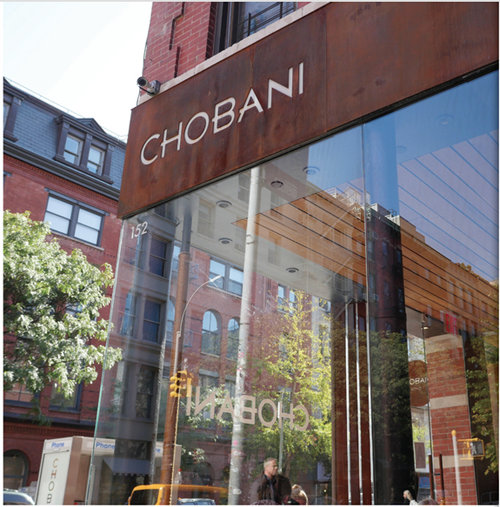 Chobani SoHo, for example, acts as an incubation and innovation center for the brand. By serving unique creations such as Mango + Avocado and Hummus + Za’atar savory yogurt creations, the cafe is getting people to try Greek Yogurt in new and interesting ways. Meanwhile, Chobani is able to gather invaluable consumer insights about which flavor combinations may best appeal to U.S. shoppers in the grocery store aisle. “We look at our point of sale [data], so we know what the favorite creations are. We staff that cafe very well with great ambassadors that are always interacting with our guests, and we do surveys to follow up with people who come in,” says McGuinness. Live events, like Food & Wine Classic in Aspen, where Chobani passed out 15,000 creations, are invaluable in promoting Chobani’s product as better food for everybody — any time of the day or night. And along the lines of exposure, Chobani’s marketing initiatives continue to explore new social media channels. A recent Super Bowl-themed BuzzFeed video was viewed eight million times in just two days, while Chobani SoHo’s burgeoning popularity makes it one of the Top 5 Most Instagrammed restaurants in New York City, according to MyFab5. Perhaps Chobani’s biggest marketing power play thus far was a national ad campaign for its Flip Greek yogurt mix-ins line, a platform launched in 2013 that suffered from a 5 percent trial rate. Chobani knew that Flip was a highly addictive food (a 50 percent repeat purchase rate proved it) and backed the launch of three new varieties with a multi-faceted campaign that promoted break-time experiences via grassroots, experiential, public relations, social/digital and influencer engagement. Two television ads for Chobani Flip tackled today’s ‘always on’ world by showing the positive impact that comes from taking a simple moment for oneself. One spot featured a nurse taking a break from her hospital shift to enjoy a delicious, nutritious snack, and a second featured a cowboy spooning into a tasty “Flip” after running his horses on a working ranch. The company even declared June 3 as “National Break You Make Day” and encouraged fans to share their #BreakYouMake moments on social media. “We wanted to position [Flip] as America’s snack as part of our whole mission to democratize good food,” says McGuinness. Succeed in this mission they did. The campaign boosted sales 300 percent over the prior year with major retailers doubling their sales volume of Chobani Flip, according to the company. More television spots were ordered, catapulting Chobani to rank first in the segment with a 35 percent share of the total mix-in yogurt category and more than 50 percent of the mix-in Greek yogurt category. Over the next decade, Chobani plans to continue its role and responsibilities as the yogurt category leader by providing consumers with new products and creations that are delicious, nutritious, natural and affordable (what Chobani calls DNNA). Chobani will reach more people in more cafes a la Chobani SoHo, at more events across the country and on more grocery store shelves. By driving Greek yogurt into more day parts, Chobani hopes to inspire its competition — as well as start-ups food companies (see For the Good of All box) — to travel down a similar path, renovating product lines with wholesome, simple food and removing artificial ingredients.